If this CES announcement makes you a tad skeptical, well, you're certainly not alone. XPAL Power, a manufacturer of mobile phone accessories, has announced the SpareOne, a new cell phone that the company says can hold its charge for up to 15 years. The $50 SpareOne is slated to ship this quarter in the U.S. 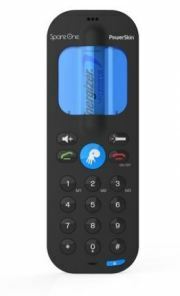 It's a dual-band GSM handset that uses a single, off-the-shelf AA (Alkaline, NiMH or Lithium) battery. It comes with an Energizer Ultimate Lithium L91, which allows the phone to hold its charge, if unused, for up to 15 years, the company claims. Talk time lasts for up to 10 hours. The no-frills SpareOne is designed for a variety of situations where your primary mobile phone--perhaps one of those power-hungry, quad-core LTE beasts with a 4-hour battery life--has either lost its charge or isn't available. Examples include roadside emergencies, tourist excursions, and various outdoor adventures. The low-cost SpareOne has a variety of corporate uses too, the company says. SpareOne "can be left in a car for emergencies, used by hotels who want to pre-program concierge numbers for guests, passed to your children or parents to maintain an open line of communication – it’s essentially designed to make and receive the most important calls, no matter what,” said Alan Cymberknoh, SpareOne project director, in a statement. You won't be streaming Netflix videos with SpareOne, naturally, but that's the whole idea. It's a throwback cell phone, slim and simple, albeit one with amazing staying power. One potential drawback: Hopefully you won't forget to pay the wireless bill for a phone you use every decade or so.